Not a Study Bible, Rather an NIV Reference Bible. On the front of the dust jacket of this Bible, the testimonial from Tim Keller is featured, “There are many Study Bibles, but none better.” This is very misleading. I have no idea why this quote is featured. I would hope that there is some good reason why Zondervan did this. Unfortunately, I can think of one and none has been provided. This is most definitely not a Study Bible. It is simply a Reference Bible with Book introductions, Concordance, and Maps. In no twist of the imagination could this be considered a Study Bible. If you are looking for a Study Bible, this is NOT one. “We find the NIV’s Committee on Bible Translation decision to substitute plural nouns and pronouns for masculine singular nouns and pronouns to be a serious theological weakness and a misguided attempt to make the truth of God’s Word more easily understood. The use of inclusive language in NIV 2011 creates the potential for minimizing the particularity of biblical revelation and, more seriously, at times undermines the saving revelation of Christ as the promised Savior of humankind. Pastors and congregations of the LCMS should be aware of this serious weakness. In our judgment this makes it inappropriate for NIV 2011 to be used as a lectionary Bible or as a Bible to be generally recommended to the laity of our church. This is not a judgment on the entirety of NIV 2011 as a translation—a task that would require a much more extensive study of NIV 2011—but an opinion as to a specific editorial decision which has serious theological implications” You can read the entire statement here. Here is a link to an excellent paper in the Westminster Theological Journal. The article was written by Dr. Vern Poythress of Westminster Theological Seminary. Dr. Poythress was also part of the Translation Oversight Committee for the English Standard Version. By prominently featuring Timothy Keller’s testimonial on the front of this Bible edition Zondervan is trying to do some damage control. As most of you know Tim Keller also was faculty at Westminster Theological Seminary. He and Poythress share much in the field of theology. By getting his stamp of approval on this Bible I believe they were hoping to bring some of us back. Admittedly, the only reason I requested this Bible for review, over the other ones offered is that his name was on the front. I was curious if something had changed for the better. I was disappointed. 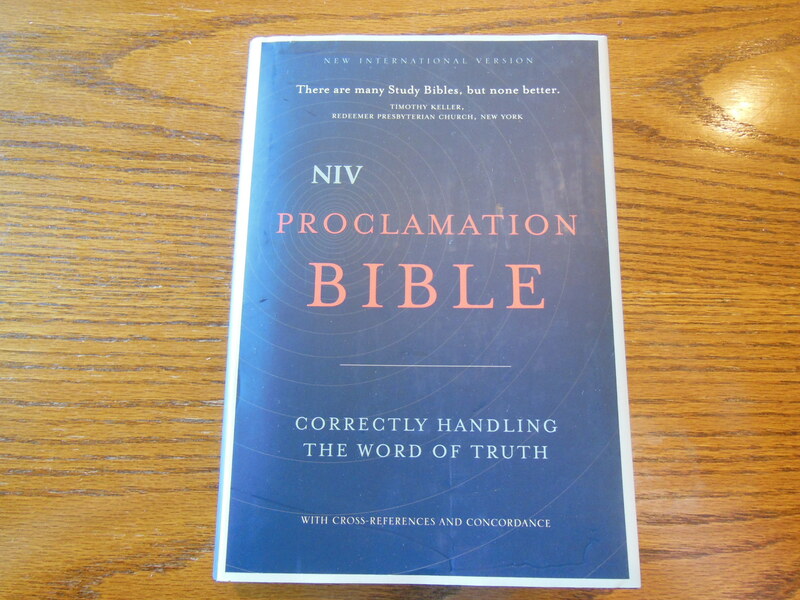 Not only was this the same NIV, with all of the gender inclusive language, but it was NOT a Study Bible. As far as the physical attributes of this Bible go, it is a pretty average to above average publication. It is blue hard back. It has a dust jacket. It is printed in China. It has two mediocre silver ribbon book markers. It is a sewn, case bound book binding. It is printed on good quality paper that is pretty opaque. The type is clear and uniform. It is 9 point font. There is limited ghosting. It is a double column, paragraph format, with references, concordance, and 14 color maps. It is nothing special, nothing distinctive, just a good quality hardback. If only they would revert back to the 1984 NIV and leave these other agendas behind. Oxford University Press, King James Version, Scofield Study Bible III, Red Letter Edition, in Burgundy Genuine Leather, with indexes, Model 524RRL.